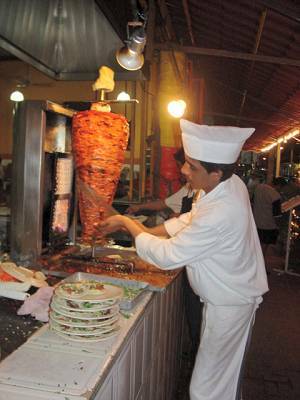 Al pastor (Spanish; "Shepherd style") is a dish developed in Mexico City, likely as a result of the adoption of the Shawarma spit-grilled meat brought by Lebanese immigrants to Mexico. Having derived from the Shawarma, it is also similar to the Turkish döner kebab and the Greek gyros which is also based on the döner. Whereas those dishes are usually lamb-based (thus the "shepherd style" name), tacos al pastor in Mexico are usually made from pork. Left: Tacos al pastor being cut from the spit (note the pineapple on top of the meat cone). Pork is marinated over one or two days with a blend of different chili peppers, spices and herbs (such as adobo), and then slowly cooked with a gas flame on a vertical rotisserie called a Trompo (lit: spinning top), very similar to how Shawarma is cooked, with a piece of fresh pineapple on top. The juice from the pineapple contains an enzyme called bromelain, which breaks down protein and makes the meat very tender. When ready, the meat is then thinly sliced off the spit with a large knife. It is served on small tortillas, with finely chopped onions, cilantro and a small slice of pineapple, and usually topped with some lime juice and hot salsa. This meat is a common ingredient in not just tacos, but also burritos, alambres and tortas.